Area rugs attract a lot of dirt, especially if they’re outside. To get rid of dirt, mix a solution of dish soap and water in a bucket. Then, scrub the rug using a large nylon brush. Make sure to clean both sides of the rug to get all the dirt off. After you’ve scrubbed it, rinse the rug with a hose. It’s best to rinse the rug on a sloped surface, like your driveway, so the water can drain away. Never let rugs soak up excess moisture and grow mold. There’s nothing more frustrating than trying to clean something and making a bigger mess. Occasionally shake out your rug to remove visible dirt and dust. You can get away with shaking it out just once a month. Don’t forget to look under your rug too. Debris will sink down, especially through natural fibers, so flip your rug over every once in a while. This will also keep it evenly worn. Note that while scrubbing works for dirt, you never want to do it for stains. It just pushes gunk deeper into your rug. Blot rug stains gently from the outside in. To help, there are a variety of miracle removers you’re likely to already have on hand. Salt is good for stains because it’s super absorbent. It also kills fleas, so it’s a win-win for pet owners. Sprinkle it over the stain before you blot. Then you have a few options for further cleaning. Dishwashing detergent will remove grease from both dishes and dirty rugs. Plain foam shaving cream doesn’t just help remove hair — leave it on a rug stain for half an hour and it’ll handle the job beautifully. For the sticky stuff, like hard candy or gum, freeze it with ice cubes, then scrape it away. If you want step-by-step rug cleaning tips, read our guide on How to Get Stains Out of Carpet and Rugs. The occasional cleaning with soap and water is all you need for month-to-month outdoor rug upkeep, but if your rug has deep-set mildew or stains, tackle them with bleach. Synthetic rugs are generally bleach safe, but spot test your bleach-water solution on a tiny corner you’d never notice to make sure the bleach won’t steal any color. Try a spray bottle instead of dumping it all at once, just in case. It’s best to use bleach where runoff won’t do any harm. Cement areas are probably your best bet. If you’ve got sensitive wood or vegetation wherever you clean your rug, cover it up with a tarp. To ensure that you don’t endanger yourself, never mix cleaning products and always use them in a well-ventilated space. Protect the skin you’re in — use gloves and a mask if you’re sensitive to chemicals. 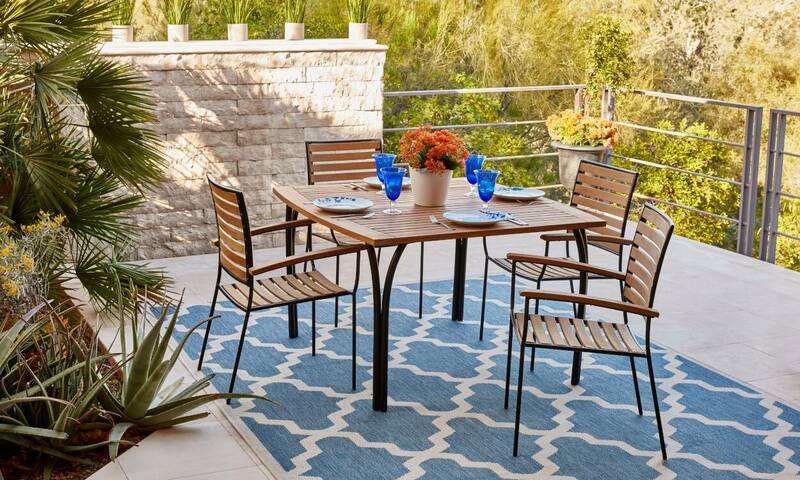 Outdoor rugs are made from synthetic fibers, which are man made. So manufacturers know to work out nature’s kinks and make these rugs more resistant to mold. However, outdoor rugs can still grow moss or algae if left to dry in damp, humid weather. Bleach is a quick solution for killing growth on outdoor rugs, but it’s not the most environmentally friendly option and can remove color. You don’t want to be constantly throwing chemicals at your rug anyway since it’s already weathering snow, sleet, and hail. An outdoor rug is a workhorse. But don’t beat that horse to death. If you have children or pets who play on the carpet, stick to using a diluted vinegar-and-water mixture and scrubbing the trouble spots thoroughly with a brush. This solution is great for rugs that aren’t bleachable so dyes don’t run. 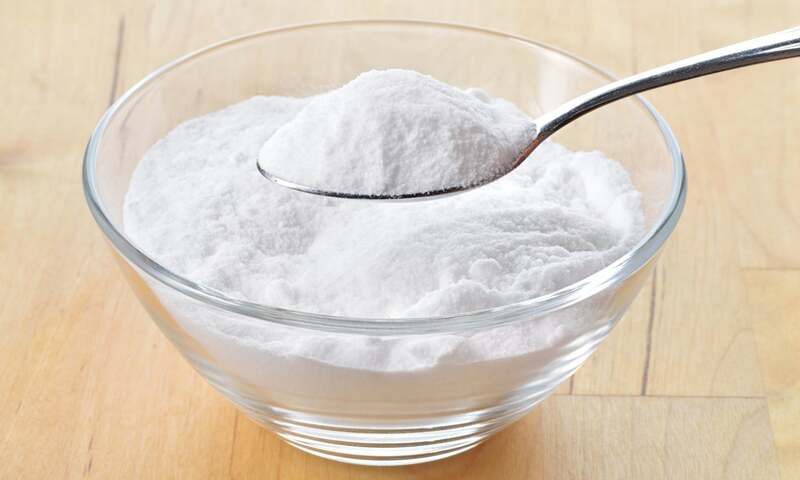 Baking soda is another alternative for stubborn stains, and when combined with vinegar, it forms a bubbling reaction for a super-deodorizing duo. Those bubbles neutralize acidic properties, which is why club soda is another effective rug-cleaning solution. Maybe mold won’t grow on your outdoor rug, but it can grow in your rug. Dirt sinks when it’s wet so it’ll be at the bottom. Any hidden dirt or moisture is prime spore real estate, so vacuum the rug well to get that stuff out. Rent a wet-dry vacuum, built to specifically suction out moisture. It might be obvious, but don’t just vacuum in one direction. Bacteria is persistent, so you want to be thorough. 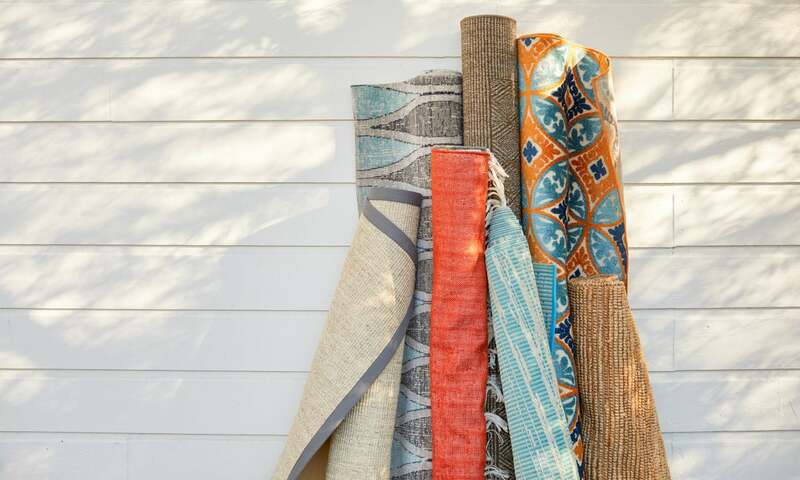 To ensure that your area rug stays free of mold growth after washing, hang the rug over a fence or a porch or balcony railing in direct sunlight. The size of the rug and surrounding humidity will affect how long it takes to dry. If you don’t have a railing, lay the rug out on the ground to dry, still in direct sunlight. Make sure you flip it over at some point to make sure both sides are totally dry. Drying your rug outside is important because a dryer’s heat will ruin your rug’s fibers. Not to mention, sunlight will scare off any mildew or moss you didn’t get to. If mold does creep into your rug, use a mixture of white vinegar and warm water and scrub the spores out. If your backyard is going to be covered in snow for months at a time, roll up your rug and store it inside instead. If you lack storage space for a large rug, roll it up, cover it with a plastic painting tarp, and secure it with bungee cords. This will also work to keep out rodents and bugs that would love a warm home in the off-season. You can also prop your rug up in the corner of your yard or deck without worrying about damage. If you don’t store your rug, at least reconsider its location. Is it soaking up lots of sun rays? Taking a beating from the rain? Trampled daily by rambunctious family members? Moving your rug to a more forgiving location could extend its life by years. Don’t feel like sweeping? Blast your outdoor rug with a leaf blower. Don’t feel like spot cleaning? Spray it down with a garden hose (this is great for big spills). Just be sure not to air blast it after wetting it down — air pressure on a wet rug can damage the fibers. Keep in mind that taking these kinds of shortcuts, especially with rougher cleaning methods, will not be as effective as painstaking rug maintenance. For extra preventative rug care, use a rug pad for your outdoor rug. It will give your rug grip and cushioning while allowing air to circulate, keeping your rug healthy. Read about all the benefits in our Rug Pad Buying Guide.